Cheniqua Johnson will deliver the student address at CEHD Commencement ceremonies. Photo supplied. Cheniqua Johnson, who is graduating with a bachelor of science degree in Family Social Science, will deliver this year’s student commencement address at the College of Education and Human Development’s undergraduate ceremonies Thursday, May 10, 5:30 p.m.
She is the first person in her family to graduate from a four-year institution and is currently the Staff Assistant/Intern Coordinator for Congressman Keith Ellison. While a student, she was actively involved in several student groups and campus organizations, including Black Motivated Women, Black Student Union, CEHD Student Senate, the Multicultural Center for Academic Excellence, TRIO Student Alliance, Undergraduate Student Advisory Board, and the U of M Women’s Center. 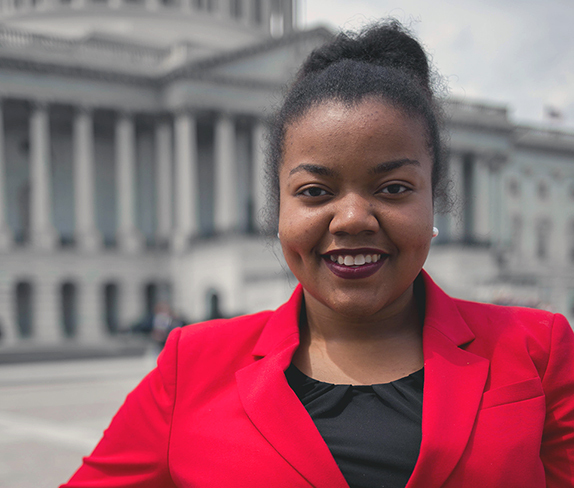 She completed a policy internship in the Office of Governor Mark Dayton and an internship in Washington D.C. through the Council for Opportunity in Education with the Office of Senator Richard J. Durbin. Johnson is currently a New Sector RISE Fellow and a participant in the Dr. Josie R. Johnson Leadership Academy, an intergenerational, year-long leadership training program for African American leaders in the Twin Cities. Her future plans include attending law school and building a career in public service. (Information supplied by CEHD communications staff). See a feature story on Cheniqua Johnson in The Globe, her hometown paper in Worthington, MN.